Want to know why the vast majority of bloggers fail, why 95% of blogs are not updated after the first six months? It’s because most new bloggers don’t really understand everything that goes into the business of blogging from SEO to monetization. They jump into writing and don’t understand why nobody is reading their blog. No visitor reading a post on which hours were spent writing is excruciatingly frustrating and more importantly means…no money. A lot of failed bloggers assume they just aren’t good writers. Successful blogging has nothing to do with your writing and everything to do with something you may not even know existed, on-page SEO. Writing for on-page search engine optimization, along with my complete SEO process, is how I rank for more than 1,700 keywords on the first page of Google alone. 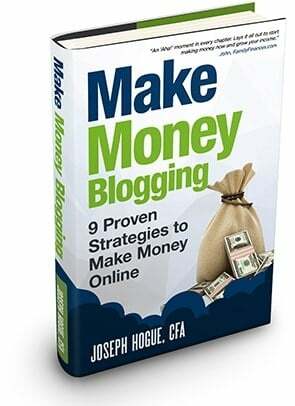 It’s how I make over $5,000 a month on my blogs even though I’ve been blogging for less than three years. Understanding why a good SEO process is critical to your success online. 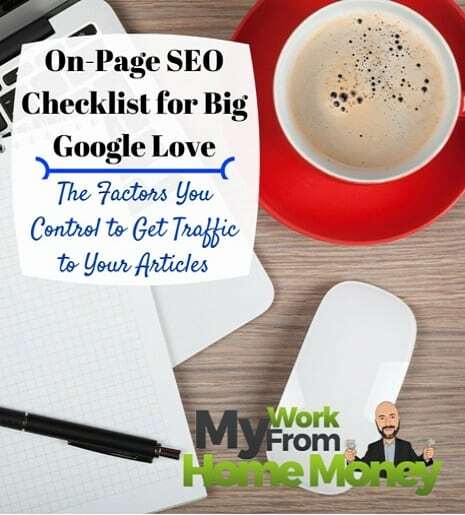 An on-page SEO checklist that will start getting you real Google traffic will put you ahead of most blogs and on your way to blogging success. I’m sharing this chapter from Google SEO for Bloggers, a step-by-step into the process I used to build my website traffic to over 50,000 a month in less than three years. 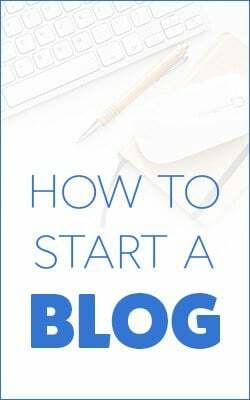 Using this exact process, I’ve been able to double my monthly blogging income every year and am on my way to a six-figure payout. 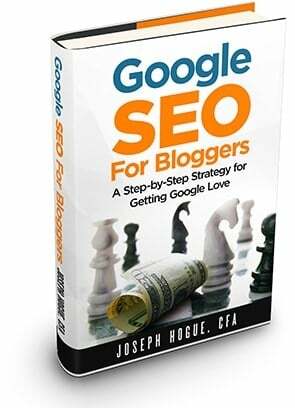 Don’t miss the rest of the book and your chance to dominate Google! Available on Kindle, paperback or Audiobook. Most bloggers go into it thinking it’s just about putting words on the screen. That’s a huge mistake and a big factor in why many bloggers fail to get the traffic they need to make money. The fact is that more than half of your blog traffic is going to come from search engines like Google. Depending on the strength of your social network, you may even get as much as 80% of your readers from Google. Given that search traffic is so important, the fact that the top ten search results get more than 70% of clicks makes search engine optimization job one for any blogger. 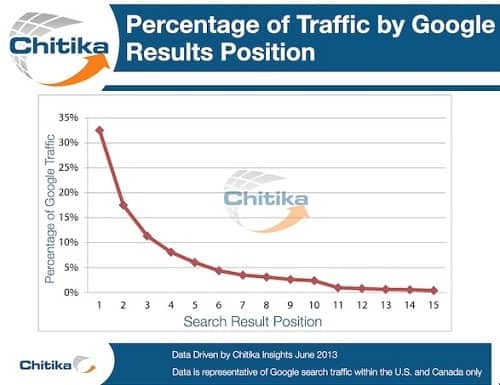 In fact, research by Chitika shows the top three search results on Google typically get nearly two-thirds the total clicks. Good SEO gets all the Google Clicks! Getting that Google love means an entire process to make your blog articles stand out to the search engine. It’s a process that few bloggers do correctly but is actually easily integrated into your writing. The process starts with writing and on-page SEO, something neglected by new bloggers but the easiest to control. After setting your blog up for on-page SEO success comes off-page optimization through link-building. That’s when people start finding your blog through search and organic linking takes over to really boost readership and keep traffic growing! 128 sites to get massive links to your articles for off-page power! This article is about getting started writing for SEO and getting found by Google through a proven on-page SEO process. While it may take time to get links to your blog from off-page SEO, following this on-page SEO checklist will start bringing Google traffic as soon as you hit publish. Getting visitors from online search is about understanding what search engines like Google do and how they work. Google wants to highlight the very best and most relevant information every time someone searches for a keyword. 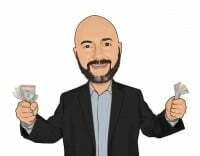 If people are happy with the results they find when using Google, they’ll come back to the search engine and that adds up to big advertising money for the company. Since Google uses a computer program to rank websites for search, it can’t make qualitative judgements by reading an article. It has to find the best quality and relevant articles by other means. Instead, Google looks at other signals like the words used in an article and readers’ reactions when they land on the website. Backlinko estimates that there are more than 200 factors Google looks at for website ranking. Besides just writing interesting and helpful content for readers, your job is to hit as many of these SEO ranking factors as possible and especially the on-page SEO factors that are within your control. There are some general things to do in your writing for on-page SEO success and some more specific ranking factors which we’ll get to later in the article. Your on-page SEO starts with good keyword research and use of similar keywords. We highlighted keyword research in our resource guide for starting a blog and making money. New blogs aren’t going to rank well for very competitive keywords but you can make a run at longer phrases. You can also use modifiers like “best” and the year to attach to your keyword, making it easier to rank on Google. Instead of just stuffing your keyword phrase into the article dozens of times, something Google is wise to and penalizing articles, use similar words to boost your relevancy. If I’m trying to rank for “on-page SEO checklist” I can also use phrases like “on-page SEO practices” and “SEO ranking list”. Most of the time, your keyword and similar phrases are going to appear naturally when you right about a topic but it always helps to go back through after your done and fit some keywords in where you can. Internal linking is another big factor in our on-page SEO checklist for multiple reasons. This is where you rank to other pages and posts on your blog from the article, something I did with our resource guide above. By linking to other posts with keyword phrases for which you want those posts to rank, you’re telling Google that those targets are important for those keywords. You also help Google find all the posts on your site by creating something like a map of links. Just be sure not to use the same keyword to link to your older post that you’re trying to rank for the article you’re writing. Google won’t know which post is more important for that keyword. One of my favorite strategies for internal linking and huge on-page SEO results is called the Hub-and-Spoke system. Think of a wheel with the center hub and lots of spokes coming out to the edge. Write one long post about a general topic or a more competitive keyword. The post should be very long (> 2,000 words) and include lots of great information. You then write separate smaller articles on related topics and link each into the ‘hub’ article. The system builds your blog’s content around a specific broad topic area and provides lots of detail around that topic. It tells Google that you are an expert by detailing all the spoke articles and that the ‘hub’ article is the most important for a big picture view. Why does your hub article need to be long-form over 2,000 words? 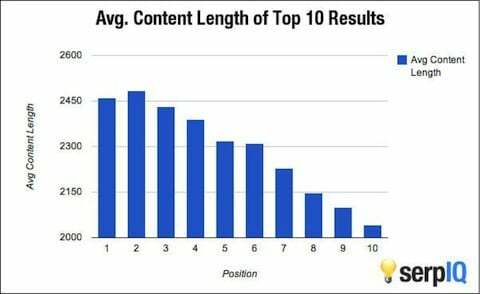 Research by SerpIQ found that the average word length for the top 10 Google results was over 2,000 words and the top few spots were around 2,400 words or more. Remember, Google is a computer so it’s not playing favorites. There are good reasons why longer articles rank better on search engines. 1) Longer articles include more opportunities to hit on an easy keyword phrase. One of the best surprises in blogging is writing a long article and having it rank highly for many different keywords. The keyword phrase you build into your on-page SEO list is the one you’re targeting but you might also rank for a range of other phrases if the article provides lots of information. 2) Longer articles offer more in-depth information and have more opportunities for getting links. Other bloggers want to provide info to their readers and which is easier, linking to a huge resource guide or trying to write it up yourself? Those inbound links from other websites are pure gold for ranking on Google. 3) Finally, longer articles keep readers on your page longer…duh! Google can’t read an article and rank it on quality. It has to look at readers’ reactions and one important marker is how long someone stays on a page. Keep a reader on the page longer and get them clicking to other pages on your site and Google will assume the reader found what they wanted. Beyond the five general factors to improve your SEO ranking on Google, there are some very important specific things you can do on every article. Follow this on-page SEO checklist to get your articles started right and get that Google love. Again, it all comes back to your keyword and the signals you send to Google. When I say ‘keyword’ I mean the keyword phrase for which you’re trying to rank, not necessarily just one word. One of the most important factors in on-page SEO ranking is where you use your keyword in the article. Title – There’s something to be said for catchy titles that draw readers but if it doesn’t include your keyword then Google doesn’t know what the article is about. URL– This is the website address of your article and usually automatically created from your title. Double check to make sure the keyword is in there and preferably right after your blog’s name. Headline – This is a one-sentence at the top of your article that tells readers what it’s about and why it’s important. You want to change the headline to an H2 tag by highlighting the text and clicking the drop-down box shown in the image below. These H-tags are important coding signals to Google that the text is important. H1 is your title, while H2 is more important than H3 and so on. First and last paragraphs – You don’t absolutely need your keyword phrase in the first and last paragraphs but it should be in the first and last 100 words. Google figures that you are setting up the topic and then summarizing in these two spots so any keywords found are going to be important to the article. Section headings – I’m always surprised when I get a guest post by someone that is just one long block of writing. You need to break your article up into at least two or more sections, each section around an idea. It helps organize your article and gives readers a break on longer posts…and it also gives you an opportunity to give another on-page SEO signal to Google by including your keyword phrase and tagging the heading with an H3 tag. Images – Google can’t look at a picture or graphic to see if it adds to the article quality. Google has to rely on other signals like the file name of the image, the description and alternative tag. Make sure you include at least one relevant image in each post and include your keyword in the tags and file name. Meta description – The meta description is the brief couple of sentences that Google shows on each search result. It’s important for getting people to click through but also as a sign to search engines about the article’s topic. If you have the Yoast SEO plug-in on your blog, you’ll write out your description at the bottom of the page in WordPress. Finally, make sure to include your keyword and similar words throughout the content. Don’t feel like you have to repeat the same phrase over and over but your keyword phrase should appear several times if the article is truly about the topic. A lot of bloggers are stingy with their outbound links. They don’t want to send readers anywhere but to internal pages on their blog. It’s a big mistake and won’t help you make any friends in the blogoverse. Linking to high authority websites in your article is also a signal to Google that the article provides quality information to readers. I always try to link to one outside source (i.e. the Backlinko reference above) to give readers extra info on a related topic. Just be sure not to use your target keyword in the outbound link or Google may think that page is more important than yours for the phrase. We’ve already talked about how longer articles keep readers on your site and why it’s important. There’s another way to do this by using different forms of media in your posts, stuff like videos and infographics. 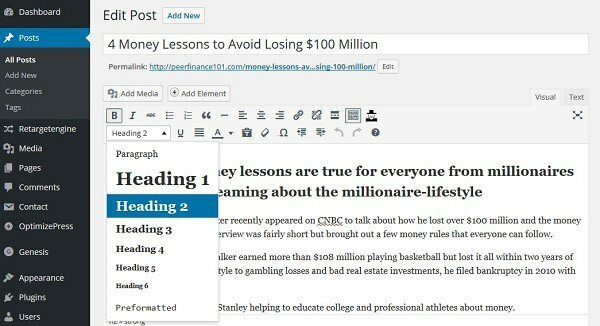 Not only will other media types engage your readers but they’ll also attract more links to your article. Social sharing plug-ins are an important part of your on-page SEO checklist because they help provide the off-page social signals to Google. I like the Shareaholic plugin because it provides floating share buttons, buttons that stay on the screen as the reader scrolls, and doesn’t slow down your website too much. Not only is social sharing on Facebook, Twitter and other networks going to bring more readers to your blog but Google will see this interaction as a sign of quality. It may not be something you do as part of your on-page SEO checklist for an individual article but there are two more factors you should watch for Google ranking. Your website needs to look just as good on mobile as it does on desktop computers. Mobile usage is becoming a huge part of internet surfing and Google wants these users to have a good experience. If your site isn’t ‘responsive’ to mobile design, it isn’t going to rank well on Google. Doing this means using a responsive theme or hiring a web developer that can make your site its best no matter how readers find you. Your website needs to load up fast. Research has found that readers won’t come back to a site if it takes longer than four seconds to load up. Google doesn’t want its search users to be frustrated by slow sites so it won’t send them to you. This means only using plugins that are absolutely necessary, optimizing your images and getting a site audit every once in a while. On-page SEO is incredibly important to your success as a blogger and surprisingly, not that difficult. It’s one of the few things in blogging where you can point to a defined process and say, “This will help make my blog successful.” Compared to all the other SEO strategies that take time and with uncertain effect, an on-page SEO checklist can help you build Google traffic immediately. I started my blog audit earlier this year. I’ve erased about a third of my content. Now, I’m focusing on SEO. It’s going to take a while to update every post, but I know that it will be worth it. Definitely a long process Jason but so worth it. SEO is so neglected by most bloggers and can be a huge advantage for those that work it into their work. Good luck, would love to hear how it turns out.